NEW YORK, New York — Armenia Fund USA, the U.S. Eastern Region affiliate of the Hayastan All-Armenian Fund, announces its two largest beneficiary projects of the 13th International Thanksgiving Telethon, starting with the construction of a potable water network in Karmir Shuka village in the Martuni Region of Karabakh. This particular project is one of a series of larger water infrastructure initiatives extending throughout Karabakh and which constitute the focus of this year’s Telethon. One of eight provinces in the Nagorno-Karabakh Republic, Martuni is located to the east of the capital Stepanakert and is estimated to be at 23,000 people, of which nearly 5,000 reside in the town of Martuni, the administrative center of the region. With 1,050 residents dispersed in 250 households, Karmir Shuka village is perhaps best-known in Karabakh for the wine factory that it proudly boasts, which delivers a brand that is quickly becoming a household name in Artsakh. Connected to a water main that was constructed in the late 1930s, Karmir Shuka confronts multiple and daily challenges at the point of accessing its water supply. Crippled by age, the main is dysfunctional, suffering massive water loss and resulting in a lack of drinking water. To compound the problem, the pipes that connect the water main to the village are not in serviceable or unsanitary conditions. 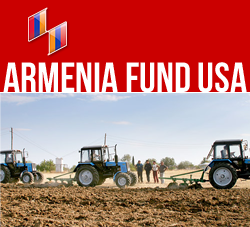 Armenia Fund USA has resolved to tackle Karmir Shuka’s water issues by creating a new distribution network to augment the potable water supply in addition to constructing water intake, purification, and sanitation stations with a functional daily regulation reservoir. This $435,200 project is one of many water infrastructure developments in several key regions and villages of Artsakh. In tandem with bringing Karmir Shuka clean and safe water, Armenia Fund USA will attend to the improvement of healthcare delivery in the Martuni Region by constructing its hospital. Following the 2005 successful construction of the first full-care outpatient center in the NKR financed by Armenia Fund USA, the Armine Pagoumian Polyclinic and the Hirair and Anna Hovnanian Diagnostic Center in Stepanakert, construction began in 2008 on a second adjacent facility, an inpatient care unit designed to increase capacity for admittance and to accommodate the demand for the center’s services. Now it is Martuni’s turn as its current structurally unsound, unhygienic hospital—in possession of only one working ambulance in its fleet of three—will be reborn. When completed, the 20 to 25-bed hospital will include pediatric, surgery, infectious disease, therapeutic, and auxiliary departments in addition to laboratories, diagnostic units, and radiology screening; the facility will be furnished with technologically sound equipment. The training program for the hospital’s medical and management personnel will start while construction is underway. As Martuni Hospital seeks to increase its 1,300 patients seen annually, this initiative is designed, in part, with the intention of reducing the outflow of patients from Martuni to other regional health posts. The hope is to reduce unnecessary, health-related travel time and expenses that Martuni residents incur in the process of venturing elsewhere for treatment. Better water infrastructure is part and parcel to this undertaking, as improving healthcare in Karabakh depends upon access to clean water supplies. Both initiatives count on the support and involvement of the government of Nagorno-Karabakh, who is charged with co-sponsorship of the water infrastructure development in Karmir Shuka as well as the erection of Martuni regional hospital. Please tune in during the Telethon to support these vital projects, two of countless efforts put forth by the Hayastan All-Armenian Fund in its pursuit of sustainable development intent on breathing continued life into Armenia and Artsakh.